Smiling architect with pc tablet. Smiling mature builder using digital tablet and looking at camera, grey background. Happy manual worker with digital tablet. Mature builder in yellow helmet standing with pc tablet and smiling at camera, chroma key background. Smiling builder working on computer tablet. Cheerful mature architect using digital tablet on chroma key background. Happy mature builder with pc tablet. Smiling costruction worker in hardhat holding computer tablet and looking at camera, blurred background. Happy construction worker with pc tablet. Smiling builder in uniform using digital tablet and looking at camera. People, repair and construction concept. Happy architect with pc tablet. 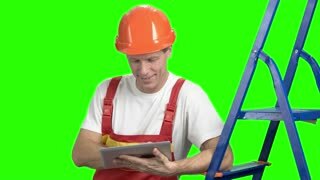 Mature smiling builder using digital tablet on chroma key background. Cheerful builder on green screen. Cheerful builder using pc tablet. Smiling engineer working on digital tablet and looking at camera, blurred background.